Here's the prologue of my book. I have made a few changes to this since the last time I posted it. What I post on here is usually a rough draft, so keep checking back to see any improvements I make. I re-read it a lot, and I often find different ways of saying things that make more sense, and sound more like Erin Hunter's writing style. Please post comments. If there is ANYTHING that can be improved that I haven't found, I would like to you to tell me so that I can change it. It was midnight. Three cats huddled together outside the medicine den entrance. The rest of the Clan were sleeping, but these three were too worried to sleep. The crisp April wind ruffled their fur, and misty clouds masked the sky overhead. The stars shone through them, shedding their watery light down onto the camp. The full moon glowed behind a thin, foggy cloud. One of the cats, a gray and white she-cat, glanced up at Silverpelt’s swathe of stars unable to ignore the clenching feeling in her chest. Would yet another cat join StarClan tonight? She shivered, and then stared down at the ground. The calico she-cat sitting next to her felt her shiver, and pressed herself closer to the young warrior. “It will be alright, Mistyfur,” she whispered. Mistyfur glanced up at her mother, her blue eyes shining with unshed tears. “I hope you’re right, Patchear,” she shakily replied. She closed her eyes as Patchear gave her a reassuring lick on the ear. Mistyfur glanced at the small tom crouched close to the den entrance. He was staring at the ground, his eyes wide as if still shocked by all that had gone on today. The small cat looked up at Mistyfur. He stared blankly for a moment, as if unaware that she was speaking to him, then he shook his head. “I’m not hungry,” he murmured, wrapping his black tail more tightly around his gray paws. He gave his silver chest fur a couple of nervous licks, and then stared off into the distance. Mistyfur was about to object, but she stopped herself. Surely the young apprentice was much too worried about his mentor to eat. She thought back to the day Silverpaw had been apprenticed. It was less than a moon ago. He and Lilystripe had both been very excited. Silverpaw was glad to finally be an apprentice. The days he had spent in the nursery had seemed like an eternity to him, and he was ready for a change. Lilystripe was proud to be getting her first apprentice. She was a young warrior, and had been an apprentice only a few moons before. The two cats had quickly bonded, and Lilystripe had shown herself to be an excellent mentor. She was kind, and patiently passed on all the knowledge she had to the eager Silverpaw. He was a quick learner, and soaked up every drop of information he was given. Mistyfur smiled as she remembered those happy days. She had often tagged along with the two cats, since she had no apprentice of her own. Then her face darkened as she remembered the awful events of the day. 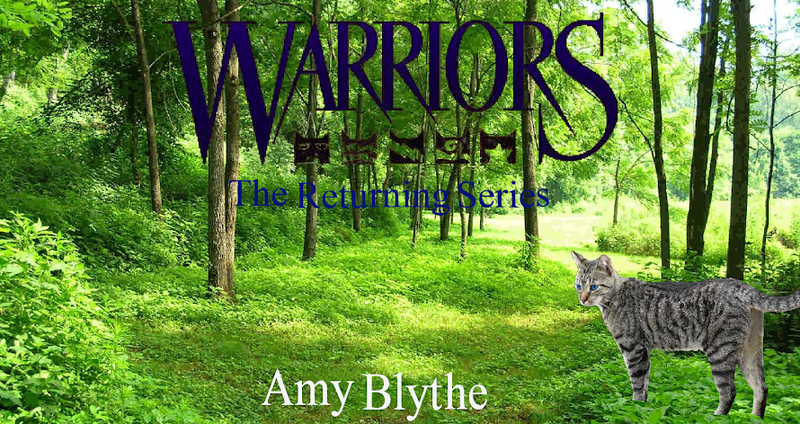 She cringed as she remembered the awful sight of Lilystripe lying on the forest floor. There was a deep gash in her side and blood oozed out of it. She had several scratches on her face and legs, and her breath came in ragged gasps. The stench of fox was overpoweringly strong. Mistyfur shook her head, trying to clear the awful memory from her mind. She looked over at Silverpaw. He was lying down with his head resting on his paws. The brown patch on his forehead stood out against his black fur, and his yellow eyes shone in the dark light. Suddenly, a grief stricken yowl split the night air. Ravenstar! Silverpaw sat up and stared into the dark entrance of the den. He could see nothing. Then Ivyfrost padded out of the den. Her white head sagged, and her eyes—one blue and one green—were filled with pain. Not physical pain, but mental anguish. Mistyfur gasped. “Lilystripe?” she whispered, already knowing the answer. Ivyfrost looked down and murmured, “She’s gone. I did everything I could, but she just… slipped away…” She looked over at Silverpaw. “I’m sorry,” she whispered. Tears rose to Silverpaw’s eyes, but he bravely asked, “May I go in and see her?” His voice quivered. Ivyfrost nodded, and Silverpaw walked slowly into the medicine den, his pawsteps heavy with grief. Silverpaw felt his own eyes fog up as he whispered, “We can’t always know the answers to everything.” He blinked away the tears that were rapidly trying to push themselves out, and bent down to lick Lilystripe’s gray tabby forehead. “Thank you, Lilystripe. You were the best mentor ever,” he murmured, barely loud enough for anyone but himself to hear. He then began sharing tongues with his dead mentor. Mistyfur and Patchear joined them in the medicine den. The four cats silently mourned the loss of Lilystripe.